Feam hazardous area electrical equipment – electrical enclosures, control stations and lighting (fluorescent, floodlight, LED lamps, incandescent) for Zone 1 and Zone 2 hazardous area applications. Feam hazardous area electrical equipment is used globally throughout industries where a potentially hazardous or explosive atmosphere could be present or develop. Feam hazardous area electrical equipment is designed and manufactured to protect the safety of workers working in potentially explosive atmospheres. Areas that are at risk from explosion are categorised into different zones – Zone 0, Zone 1 and Zone 2. Feam manufactures a full range of products suitable for use in each zone. The range of hazardous area products are used globally and certified for use throughout many industries globally including oil and gas, offshore/marine, petrochemical, mining and rail. Products can be specified and supplied individually or a full ATEX rated system can be provided. Feam EXD hazardous area enclosures are available manufactured from a range of materials including stainless steel, aluminium and glass reinforced polyester (GRP). ExD electrical enclosures are suitable and certified for use within Zone 1 And Zone 2 rated hazardous areas. ExD junction boxes protect signal and power distribution ensuring an uninterrupted power supply within hazardous areas. 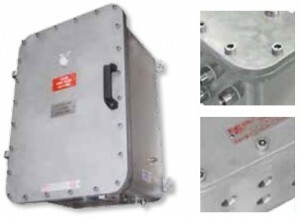 The enclosures are manufactured from rugged materials and designed to have a long product lifetime. The range of hazardous area ExD junction boxes are certified to international hazardous area standards including ATEX, IECEx, INMETRO, GOST-R and GOST-K. The range of intrinsically safe junction boxes are manufactured from marine grade copper and aluminium. T&D were established in 1985 and are now one of the largest Feam Distributors and stockists – we provide expert technical support, competitive quotations and international delivery for hazardous area enclosures, control stations and lighting. T&D are worldwide exporters of LV-HV Electrical Equipment, Cables, Cable Accessories & Jointing products – we service UK and global businesses involved in low and high voltage cable installations, cable jointing, substation and overhead line construction at LV, 11kV, 33kV and EHV in both industrial and hazardous areas. T&D’s technical articles and blogs provide news, information and customer support. Feam since 1961 is a leading manufacturer of explosion proof electrical equipment mainly directed to the Petrochemical, Oil & Gas and Chemical industries. Their main focus is on continuos R&D, innovation and upgrade of production processes. Feam is able to provide both standardized and tailored solutions to meet specific customer’s needs. Today Feam is in a leading position in Europe, Middle East, North Africa and Far East. Feam maintains a highly active policy of quality management and development. For this reason Feam has gained accreditation for Quality Assurance according to ISO 9001 standard and according to European ATEX and Russian GOST-R (RTR) directives. Integrity & Values. T&D are a world-class business committed to ensuring the correct installation and application of all products we distribute. Where applicable installer training and support services including site surveys can be made available.